I'm hard at work cleaning out my office. Yesterday's electronics recycling was just the tip of the iceberg. I've had a fairly productive morning. Anyway, over in the corner of the office I found a bag full of stuff I cleaned out of my first car (a 1986 Chevette) when we got rid of it in 1997. Don't ask me why I still have this crap. 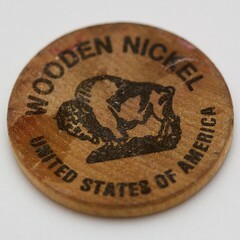 Among many cassette tapes and the vintage chewing gum I found an old Royal Donut wooden nickel. 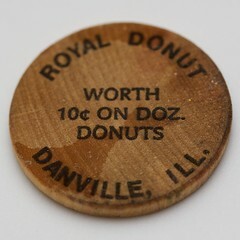 Despite the fact that they are labeled wooden nickel, apparently they were good for $0.10 off a dozen donuts at the Danville restaurant chain. I remember using these as a child, but I really don't remember how we acquired them.